Many crime novels straddle the line between crime and horror. Serial killers, on the whole, are the stuff of nightmares and crime writers have been falling over themselves for some time to up the gore factor. While horror novels usually rely on some form of supernatural agency and do not necessarily have the neat resolution of the crime genre, the bloody results are often the same. And so it is with The Poison Artist – a crime novel with the feel of a horror novel or a horror novel with crime elements – it is often hard to tell. Although in this case that ambiguity is not a bad thing. Before the reader gets to the crime there is the pain. Dr Caleb Maddox, toxicologist and pain researcher, has been dumped by his girlfriend after a fairly vicious fight which involved flinging of glass. Caleb is drowning his sorrows in the bar of the San Francisco hotel in which he is taking refuge when he catches sight of a beautiful woman. He moves on to a smaller nearby where he encounters the same woman who thoroughly bewitches him to the extent that he begins a city-wide search for her. At the same time there is a serial killer at work. Bodies are washing up in San Francisco harbour, seeming suicides but with strange marks on their shoulders which suggests something else. The last known location of the latest victim is the small bar in which Caleb had been drinking. Frustrated by a lack of progress, and suspecting problems in his own lab which are later confirmed, the chief medical examiner, who also happens to be an old friend, calls Caleb in on the sly to re-examine the victims for poisons. Caleb fails to mention at that point that he is also being questioned by the police in relation to the crimes. There is plenty of mystery in this set-up and Moore holds a lot back, including the reason for the fight between Caleb and Bridget and the deep trauma in Caleb’s past. The reader has to work though layers of character-based mystery through to the final, breathtaking revelations. But enough happens for this coyness not to feel too forced. The San Francisco setting is effectively used. The narrow, darkened alleyways coupled with the ever present-fog give a Victorian-era feel. This is accentuated by the use of old buildings and backroom bars and Caleb’s obsession with learning the arcane observances around the drinking of absinthe. While there is both the police investigation, and Caleb’s own off-the-books investigation, to ground the crime elements, this environment and Caleb’s state of almost perpetual drunkenness gives the narrative a dreamlike feel that adds to the growing sense of dread and allows the present to merge with the past. Much like Thomas Harris, with a little bit of Edgar Allen Poe thrown in, Jonathan Moore has produced an effective hybrid of crime and horror. 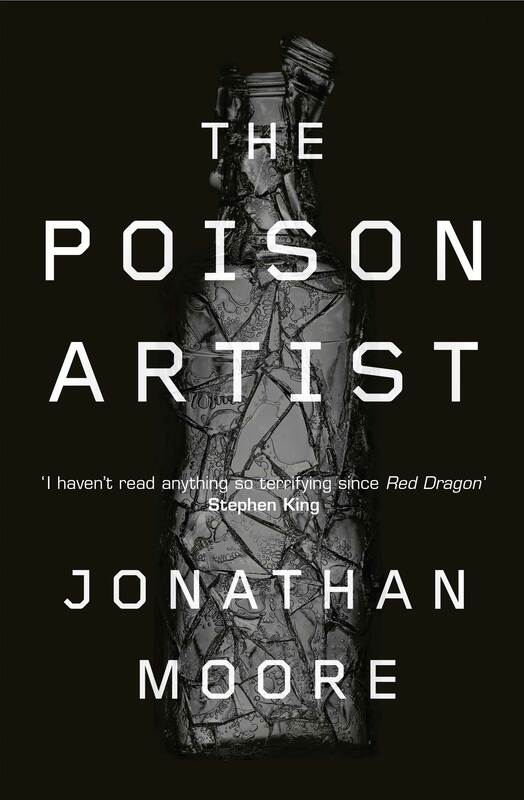 The Poison Artist is overall a compulsively creepy thriller.